The Maine Conservation Corps was established by Maine's governor and legislature in 1983 and since then has recruited and placed hundreds of members who have accomplished countless natural resource projects all over Maine. Constructing and maintaining sustainable trails on state, federal and public lands. Working on community conservation and environmental service projects. Building relationships and serving with community partners. Developing the values of citizenship, civic engagement, and personal responsibility. Studying natural and environmental sciences and ecological and conservation issues. Teaching environmental and conservation education in schools and in the community. Recruiting and managing hundreds of volunteers to support projects that improve and impact trails, watersheds, air quality, and service opportunities for Maine's youth. Enhancing personal development through job skills training, team building, service learning and modeling an ethic of service to the community. Accomplish outdoor recreation and conservation projects: This is the primary focus of all MCC programs. 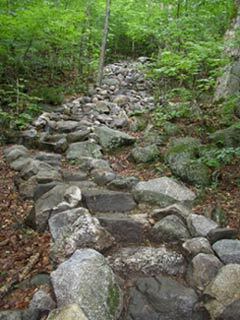 Members build and rehabilitate campsites and trails (more non-motorized trails than any other organization in Maine), build outdoor learning centers for schools, construct cabins, picnic shelters, bridges and erosion control structures, maintain boundaries, improve wildlife habitat and timber stands, survey watersheds, test water quality, and oversee planting projects. Conservation education: MCC strives to raise awareness and interest in the natural environment. Individual members serving with nonprofit organizations and natural resource agencies help develop curriculum, train volunteers, teach in classrooms, and do outreach presentations in the community. Volunteer opportunities: The MCC recruits volunteers to serve alongside MCC teams and individual members at projects all over the state. Volunteers can join the MCC on the trail, in the classroom, or on the water to get involved in local efforts to protect and restore the environment. Benefits to participants: MCC programs develop a strong work and community service ethic, teamwork, communication skills, self-esteem and confidence, safety, job skills and outdoor living experiences. Members receive a weekly living allowance, opportunities for conservation networking, and gain experience in environmental careers. Most members are eligible to earn an AmeriCorps education award.